I’m pleased to announce that the first round of Chosen artwork has arrived! And…okay, most of it is my own and thus is imbued with a certain lack of what one might call “artistic talent,” but meh, details. First up, we have a pencil sketch of Silas Phelps, the sweet-faced bully whose hobbies are being rich, coming to class late, and beating the crap out of Kaine. Lovely girl, really. Next is Elisabeth Defrin, Mr. Defrin’s wife and Nicholas’ mother. Sweet and quirky, with a (mostly) sunny outlook and a rather serious addiction to tea, Elisabeth looks a lot like Amanda Abbington (or would if I could draw her properly) primarily because I was watching an unhealthy amount of Sherlock when I was writing her scenes. Next, a sketch of Nicholas and Kaine when they’re a bit older. Stubble added because they looked like girls otherwise. Pretty, pretty girls. 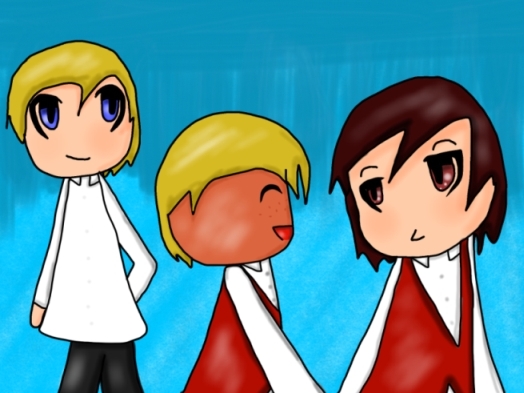 A fun, colorful artwork of Mr. Defrin, Nicholas, and Kaine, done by MarcoEmma over on deviantart. This picture has brought me a lot of joy, I have to say. For a story that’s somewhat dark, having a picture like this of three of the main characters is pretty awesome. Thanks, MarcoEmma! And now, since my upstairs neighbor woke me up at 4:00 in the morning with her drunken singing and stomping around, I’m going to go collapse face-down on my bed and not get up until the sun is shining again.